The scenery around the Gitgit waterfall is still very natural. Gitgit Waterfall has a large current with a cliff height of about 35 meters. Falling water rushed towards the large pond below. The fresh nuance presented by the highest waterfall in Bali is suitable for nature lovers who love trekking or photography. When visiting this one tourist attraction, you are not only treated to one waterfall. Around the Gitgit waterfall there are several other waterfalls that are interconnected and have equally beautiful scenery. 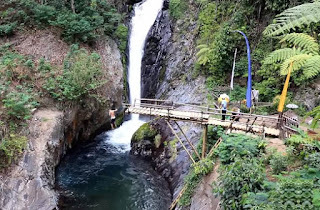 In addition, you will observe other natural beauty from the start, you walk from the parking lot to the waterfall, including the scenery of rice fields and birds singing. To get to the location of the parking lot, visitors must walk through the clove and coffee gardens as well as rice fields, with cool and unique nuances in the mountains. Arriving at the place of this waterfall, the impression of natural, beautiful, and far from pollution, dew or water vapor which is blown by the breeze, truly a natural therapy that can refresh the body and spirit, a pleasant trip and recreation. In order not to be curious, you should provide a long enough time when you visit the tourist attraction of Gitgit waterfall. The most famous waterfall is Gitgit waterfall. In a location not far from Gitgit waterfall, there are 2 more waterfalls, namely the multilevel waterfall and Twin Waterfall. All the waterfalls are beautiful and clear of water. The three waterfalls are in Gitgit Village, Sukasada District, Buleleng, Bali. To get to Gitgit, it takes around 1.5 to 2 hours by motorbike or car. From Denpasar City, you can take the road leading to Bedugul and continue north towards Singaraja City. The three waterfalls are on the left side of the road and we can see instructions from each waterfall. And hopefully this place gives a new impression on your tour.